152 voters at the Big House of Charles Brown participated in this election. Robert Bradley and James Harley were the managers of the election at the Big House of Charles Brown. 32 voters at Kelly's Cowpens participated in this election. 180 voters at Michael Zaegler's participated in this election. The voting list has 181 names, but on the back is written: "180 votes to the Senate and Representatives." The numbers 367, 278, 278 were written on the back of the poll sheet. George Bruton and William Cannon were the managers of the election at Michael Zaegler's. 185 voters at Winton participated in this election. 103 voters participated in this election at an unknown location. Original Election Returns. South Carolina Department of Archives and History, Columbia. 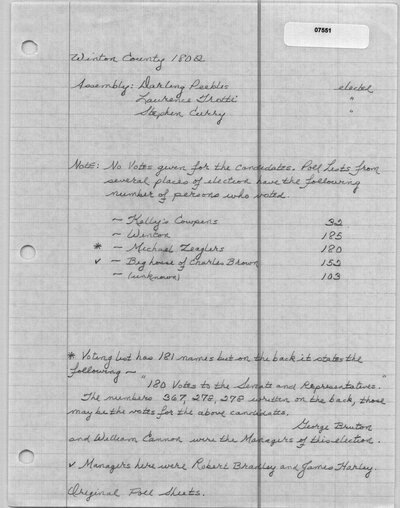 Original Poll Sheet. South Carolina Department of Archives and History, Columbia. Biographical Directory of the South Carolina House of Representatives. Vol. 1. Columbia, SC: University of South Carolina Press, 1974. 263.